And then there were… 44. 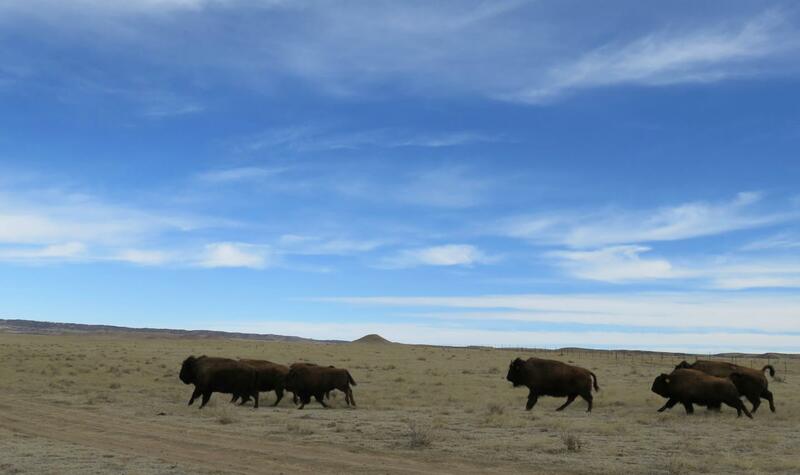 Eight bison — four calves and their mothers — were released in mid-March on public lands in northern Colorado, bringing the total number of animals in the Laramie Foothills Bison Conservation Herd to 44. A 10-month-old calf known as IVF 1 was among the newcomers. She is the first bison calf conceived using in vitro fertilization, or IVF, at Colorado State University. Jennifer Barfield, a reproductive physiologist with the CSU Animal Reproduction and Biotechnology Laboratory, was beaming with pride as she described the landmark moment. "It's a really good feeling to see a herd grow and to know that the animals from our research are going to have a real impact, not only in our herd but as we produce animals in this herd and help support other conservation herds," she said. Project partners also heralded the breakthrough. "CSU and the research being conducted by Dr. Barfield has always been a cornerstone to this project," said Daylan Figgs, senior environmental planner for City of Fort Collins Natural Areas. "The IVF calf represents not only a research milestone, but a great success story in the conservation of this iconic grassland species." The herd was established at Soapstone Prairie Natural Area and Red Mountain Open Space in November 2015, and is managed jointly by the City of Fort Collins, Larimer County and CSU. "We are pleased to see the Laramie Foothills Bison Conservation Herd thriving and the public response so positive for this collaborative effort," said Meegan Flenniken, planning and resource program manager for Larimer County Department of Natural Resources. Using any type of reproductive technology can be challenging. The IVF process for bison is similar to that for humans, and in women under age 35, the live birth IVF success rate is 40 percent. The success rate of IVF in bison is not known. "Just because we bring an egg into the lab and we fertilize it, it doesn't mean that the result will be a baby bison," said Barfield. Barfield said her research team had previously focused on using in vivo produced embryos, ones that were fertilized inside a bison, and subsequently moved to a different animal. For this project, researchers used eggs taken from bison from Yellowstone National Park and fertilized them with sperm from bulls with Yellowstone genetics in the lab. Seven days after fertilization, the eggs were put through a rapid cooling process known as vitrification, similar to freezing. Scientists use vitrification to preserve the embryos and transfer them during breeding season. The research team thawed a small number of embryos in 2016, and transferred them to nine female bison. The research team collects reproductive material from Yellowstone bison outside of the breeding season, which means the quality of the eggs may not be as good compared with collecting eggs when an animal is in the breeding season and ready to get pregnant. Barfield said the result, or IVF 1, was unexpected. "I didn't have a lot of hopes for this particular embryo, because she didn't look that great," she said. "But she defied the odds and survived." Barfield said the team will transfer more IVF embryos later this year. She and the project partners hope to one day have 100 bison in the Laramie Foothills Bison Conservation Herd. Dr. Mark Stetter, a wildlife veterinarian and dean of the CSU College of Veterinary Medicine and Biomedical Sciences, said the bison's reintroduction is a "phenomenal" conservation story which demonstrates how cutting edge research and collaborative relationships can really make a difference in helping nature. The use of this reproductive technology in American bison also opens up another avenue for conservation efforts. Barfield's lab at CSU has approximately 1,500 frozen embryos that could be used in a year, or even in a hundred years. "That gives us the opportunity to access these Yellowstone genetics for a very long time," she said. So, if something were to happen to the herd in Yellowstone National Park and the bison's numbers dwindled, the frozen embryos could become quite valuable. It also means the risk of extinction is greatly decreased. "Not only do the embryos carry the Yellowstone genetics, but they're also brucellosis-free, which is really important for the Yellowstone bison," she said. Brucellosis is an infectious disease that can cause abortions and plagues bison in the Greater Yellowstone Area. Its presence typically makes it challenging to move the bison beyond those geographic confines. "Dr. Barfield's innovative research is having a major impact across the country, from the Bronx Zoo in New York to the prairies of the West," Stetter added. "This unique partnership is really special and will make a difference for generations to come."